children. In fact, those first prayers for my girls were probably some of the most deeply moving prayers I have ever uttered for them. They were prayers of surrender…prayers of humility. I realized in those early prayers that my children were not my own. I had a profound sense that God alone created them. (You know what I mean. As a Dad, I had a remarkably small role in their creation). I realized while they were still being formed in my wife’s womb that God was the One knitting them together cell-by-cell. I never attached a retina to the back of an eye. I never connected the heart to an artery or jump-started its beating with my hands. God did those things. So, as I uttered those pre-birth prayers for them, I understood how important prayer would be to their lives. Something about those first few months of life changed my prayers. After having an infant that screamed day and night…for six long months…my prayers for my children came with a “P.S.” Not only did I pray that God would invade their lives, but I prayed that He would protect my sanity and the sanity of my wife. I also prayed that all of us would get some rest. Thankfully, we survived three infant girls in less than five years. Later, we survived the first days of school and now we’re hoping to survive the first talks about the dreaded “B” word … boys. With each of these stages, my prayers for our children have changed slightly. They have become more specific. They have become more personalized for each child. However, I recently realized that I was failing in my times of prayer. It’s hard to fail at prayer, but I did it! I realized that while I had spent regular time praying for my children, I was not spending nearly as much time praying with my children. As a result, they were missing the joys of speaking – and listening – to the One who knew them most intimately. 1. Include children in praying over family decisions. As a parent, you have the final say in all family issues, but we have learned to be intentional about asking our girls to pray about family matters. We allow them a day or two to listen to God (in their hearts) and seek His answer. Then, we take them seriously. We let them share their perceived answers first so that we don’t influence their thoughts. Then, J.D. and I will share how we are feeling led. It is amazing how often we’re all on the same page! 2. Pray spontaneously. As you become aware of needs or as you hear of people who need your prayers, stop immediately and pray with your children. Many people are notoriously bad about saying, “I’ll pray for you” and never getting around to that time of prayer. Therefore, to demonstrate that prayer really is important to our family, we find times to stop and pray spontaneously as God prompts us. A few days ago, we were traveling out of town. I was invited to preach at a church and as we drove, we were all fighting bad attitudes. About 30 minutes from the church, after several arguments, we pulled over on the side of the highway and prayed together. After those few minutes in prayer, it was like a weight lifted from all of us and we were able to navigate that night with much better mindsets. 3. 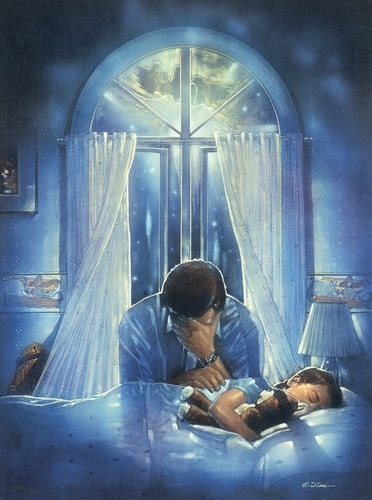 Pray before meals and before bed. I know this sounds simplistic, but it works! When I was a child, my parents were champs at this. They would pray with us before meals and then they would lie beside us before we went to sleep. Each night as we prayed, I would thank God for the “green grass and the trees.” I wasn’t very creative with those prayers, but the routine shaped me. It prepared me to spend personal time with God as I got older. And for the last few years, my wife and I have been praying with our children in this same manner. 4. Thank God for moments of laughter. We don’t ever want our girls to get the sense that spending time with God is somber or depressing. (What child wants to follow a depressing old man whose primary job is to get them in trouble?) Therefore, when we pray with them, we will often thank God for the fun or funny moments of our days. We may name those moments specifically and with joy tell Him that we appreciate the sense of humor that He has given each of us. 5. Pray honestly. Children – even those with ADHD – are extremely observant. They know when we are hurting or sad. They feel it when their parents are struggling. So, we try to pray honestly with our children. Granted, children don’t need to know everything. But, they do need to see us praying with authenticity and transparency. Some of the more profound moments of prayer for our children have come in times where they were praying for their grandmother’s battle with cancer. Some of the more profound conversations have come out of prayers of desperation. When we have needed additional income to make ends meet, we’ve prayed about this with our children and reminded them that God is the provider of all that we own. As you pray with your children in each of these ways, you help them to become more than “good kids.” Praying with your children will encourage them to become spiritually healthy disciples. To read more on the subject of raising spiritually healthy children, get John’s eBook, Parent Shift: Raising Spiritually Healthy Children, on Amazon, for less than four dollars.